Honolulu has a wide range of memorable restaurants. Here, there are many fine places for breakfast, lunch and dinner of all styles. But what if you wanted brunch? While options for brunch places in Honolulu are endless, here are some of the more notable ones. The Hau Tree Lanai at New Otani Kaimana Beach Hotel is a great place for exquisite brunch food. Furthermore, their outdoor patio fronts an idyllic beach. And it’s iconic hau tree overhanging the restaurant’s tables offers maximum ambiance. This may be one of the most picturesque brunch places in Honolulu. The brunch menu includes taro pancakes, crab eggs Benedict and Hawaiian French toast. Juices like papaya, guava, papaya and more makes this a stand-out restaurant. Travel Channel filmed the famous Pancake Challenge on a Man vs. Food episode at Mac 24/7. This restaurant still offers the same menu items from that show. It included The Elvis with pancakes, banana and peanut butter and Cinnamon Streusel with vanilla glaze. They also serve flavorful drinks like plantation iced tea, shakes and smoothies. In addition, they offer red velvet pancakes, banana praline pancakes, freshly-baked muffins and eggs of any style. At Mac 24/7, breakfast foods are served around the clock, just as their name suggests. Hawaii Prince Hotel’s Prince Court serves Sunday brunch from 10 am to 1 pm. Although the menu varies, you can always find an assortment of brunch items. Examples include guava and passion juice, omelets, pastries and even a soup and salad bar. There is also a handful of rich desserts for those who enjoy sweets on the weekend. Cream Pot is the perfect place for a dreamy brunch due to its European garden ambiance. This inviting restaurant serves scrumptious plates like French toast, rolled omelets and citrus salads. Their desserts include strawberry waffles, blueberry crepes and fruit smoothies. Cream Pot is open Wednesday to Monday from 6:30 am to 2:30 pm. 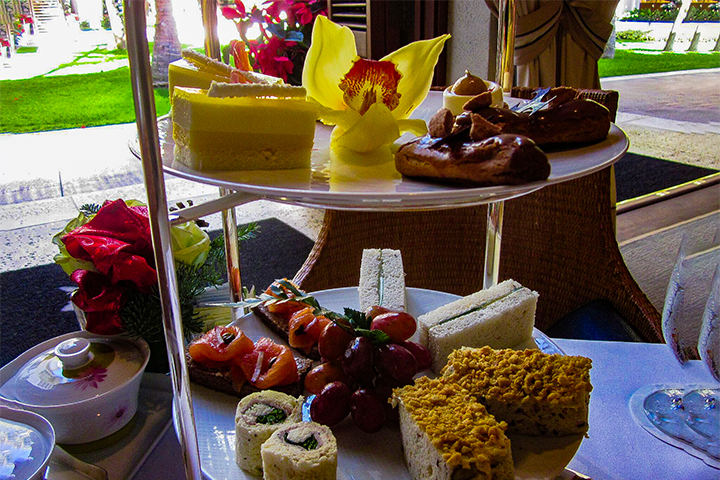 Halekulani Hotel’s Orchids restaurant has won Honolulu Magazine’s Gold Award for best brunch. Adding to this prestigious honor, it offers some of the best scenic views of Waikiki Beach and Diamond Head. This may be the one of the most elegant brunch places in Honolulu. Guests can choose from traditional American brunch plates and continental breakfast. They also serve traditional Japanese breakfasts of broiled fish, soft boiled eggs, miso soup, pickled vegetables and rice porridge. There are also unique options such as smoked meats and fish, haupia bread French toast and quinoa carrot cake. Moreover, they serve popovers, their signature dish since 1917. The Sunday brunches here are world-class. In addition to its fine cuisine, guests will be serenaded with live music every Sunday morning. The Plumeria Beach House is an award-winning restaurant at the Kahala Hotel & Resort. It serves brunch on a stunning outdoor patio where fresh breezes blow from the ocean. You can get breakfast from 6:30 am to 11:30 am on weekdays and until noon on weekends. The menu offers everything from ornate omelets to French toast with maple butter, buttermilk pancakes and crepes. Guests can enjoy papaya and grapefruit sides, yogurt and a variety of delicious tropical drinks. Kids under 5 years enjoy brunch for free. Cafe Kaila serves brunch until the restaurant closes at 3 pm. Guests can top pancakes and Belgian waffles with caramelized apples or fresh berries. They can also sip Kona coffee while enjoy piping hot frittata, breakfast wraps or breakfast quesadillas. The restaurants makes all of its dishes from scratch, including muffins, scones, banana bread and French toast. There is no doubt why this amazing restaurant won a Hale Aina Award for best breakfast. Before heading out, start the morning off with brunch at the historic Royal Hawaiian Hotel’s Surf Room. Here, you can dine in front of Waikiki Beach on gourmet dishes. Examples include prime rib, veal, omelets with lemon caviar cream and endless options from the extensive buffet. While not your average Sunday brunch, the Surf Room is well-suited for any special occasion. Sweet E’s Cafe at Kilohana Square serves brunch all day. It offers delectable dishes such as spicy Portuguese sausage, kalua pig sliders and build-your-own omelets. Here’s an interesting feature of this restaurant. Every menu item begins with the letter “e.” Examples on the menu include: Extreme Mess of Eggs, Elated Pancakes or Enchanting French Toast. Yogurstory capitalizes on the trend of eating breakfast foods any time of the day. This is why it serves brunch until 5 pm daily. Its menu is enough to make anyone’s mouth water and the prices are all affordable. Try its thick stack of purple-hued Filipino ube pancakes. Or indulge in its dulce de leche waffle topped with caramelized banana and pretzels. After doing so, you may not have room for the savory prime rib loco moco or the classic eggs Benedict. There is also guava, pineapple or passion fruit juice to wet your whistle.